This page is for indies exhibiting at The MIX at E3, Wednesday, June 17, 2015. If you have not already done so, please be sure to submit your information and payment through this form. Our team posts games to the website as payments come in. Each exhibitor will get a table provided by the event organizers. We’ve arranged for signage for each exhibitor with our vendor, which is a 16″x20″ table top sign (foamcore) with an easel attached to the back at no additional charge to you. Upload your files to this form by midnight PST, Friday, June 5. We will take care of getting signs to the venue on June 17 for the event. We suggest having comp codes available for distribution to the press if relevant for your game. You might also want to have giveaways/schwag at your table too. Each exhibitor is responsible for bringing equipment to demo their games. Be sure to bring external speakers and/or headphones for gamers coming to your kiosk. There are power outlets throughout the space. Please bring power strips and extension cords that you have. We’re expecting to have complementary 20-22″ monitors available for exhibitors who need them (one per game). The space will be open beginning at 2 pm on June 17 for set up. You don’t need to arrive that early, and it most likely wouldn’t take too long to get your space set up. Please have your set-up concluded by 4:00 pm (there will be another activity in the event space after 4:00 pm). The event begins at 6:30 pm and goes until 11:00 pm. Break-down begins immediately after the event ends at 11:00 pm. All exhibitor materials must be removed the evening of June 17. 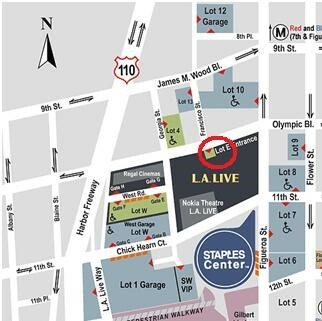 The best place to unload and park is in the venue’s East Garage/Lot E. The entrance to the parking structure is located off Olympic and Francisco, right next to Yard House Restaurant. Please drive down the ramp and make a left at the next ramp before the ticket booth. This brings you to the P2 level. Once you pull a ticket, you can park anywhere but it is best to park near the north side walls – they are painted a blue color and have a single door. You can park and unload from here. Just make sure you park in an actual spot that is not reserved. At these blue walls you will see the door with a security call box next to it. Buzz yourself in and tell security who you are and that you are here for the event on the Target Terrace. Once you are buzzed in, you will see a freight and service elevator behind the door. You can take either up to the Terrace which is on the 5th floor. Please note there is a parking cost upon exiting this garage.